A1 Security Cameras - S H E A - Use promo code UNMPROMO with your unm.edu email address to receive 10% off our professional S3-brand security cameras and security systems. Please visit us on the web at a1security cameras.com. A Celebration of Love Wedding Chapel - S H E A R - 10% off Weddings, Renewal of Vows and Commitment ceremonies. Please email us at acelebrationofloveweddings@gmail.com for more information. Aikido of Albuquerque - S H E A R - Aikido of Albuquerque offers instruction in martial arts. We offer The University of New Mexico community FREE registration when you sign-up, a $35 value. There are many classes from which to choose. You can train in Aikido, sword, weapons, self-defense, and kids martial arts classes. For more information, please visit us on the web at aikidoofabq.com. Our location is 5600 McLeod NE Suite P, Albuquerque, NM 87109. Air Purifier Source - S H E A R - 10% off all air purifiers, air filters and replacement parts by Surround Air and NQ Industries. Experience the value and service you deserve. Discount available from our online store, by using discount code LOBO10 at checkout. Please visit us on the web at airpurifiersource.com. Albuquerque Folk Festival - S H E A R - Get discounted tickets for the Albuquerque Folk Festival, happening June 7th, 2014. A $3 discount can be applied to the "Gate" entrance fees (including already discounted tickets for seniors or students). This cannot be combined with any other coupon or advanced tickets. Click here for a coupon. The festival will be at the Albuquerque Balloon Museum. Gates open at 10:00. For more information, please visit us on the web at abqfolkfest.org. AllMighty Clean - S H E A R - 20% discount on all cleaning services. These Include Carpet Steam Cleaning, Tile and Grout Steam Cleaning and Upholstery Steam Cleaning. The 20% discount also applies to Carpet repair services. These services include Carpet Re-Stretch, Patching, Transition Repair and Spot Color Matching. In the event you need Emergency Flood Services we will discount our emergency service call 50%. We work with all Insurance companies so this discount will give relief for your deductible if you need Emergency Water Extraction or Structural Drying Services. Discount available from Our World HQ located in Rio Rancho Serving the Entire Metro area. Please visit us on the web at AllMightyClean.com. All Sports Trophies, Inc. - S H E - 10¢ per character on plaque engraving; 20% off AIRFLYTE products, excluding acrylics and glass. Discount available at our 2939 Monte Vista Blvd NE location. Visit us on the web at allsportstrophies.net. Amore Neapolitan Pizzeria - S H E - Get 10% off with ID. We are New Mexico's first and only certified pizzeria. "Lobo Lunch" is double discounts to students with ID daily between 2 p.m. - 5 p.m. We serve wood fired pizza, calzones, paninis, local beers, Italian wines, and more. Please visit AmoreABQ.com to see our extensive menu. We are located at 2929 Monte Vista Blvd NE, and can be reached at 505-554-1967. An Angel's Touch Medical Massage - S H E A R - 10% discount on therapeutic/medical massage and angelic intuitive. Experience healing physically and spiritually. Release scar tissue, facilitate rehabilitation from surgery, carpal tunnel system, and whiplash. Heavenly relaxation at 40 First Plaza, SW Center for Pain Management. Please call 505-234-3920 or email queenwillowja@gmail.com for more information. Andy's Auto Sport - S H E A R - Receive 5% off an unlimited amount of purchases within our online store by entering the discount code LOBOPERK at the time of purchase. Please visit us on the web at andysautosport.com. Angel Fire Resort - S - We are a ski and snowboarding resort, featuring lodging, restaurants, year-round activities and meeting spaces. For the 2014-2015 winter season (12/12/2014 through 03/22/2015) we offer current UNM students the following discounts. 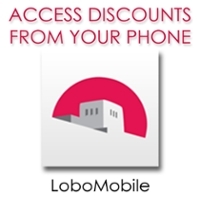 Note: *You must show your UNM student LoboCard to get the discounts. *Black-out dates for lodging and lift tickets are 12/19/14 through 01/04/15, 2/13/15 through 02/16/15, and 03/06/15 through 03/17/15. *There are no black-out dates on the food, beverage, or retail discounts. Lodging: 15% discount and a room upgrade if available. Lift Tickets: $10 off based on the Military/Teen Price. Prices are here. Food & Beverage: Buy two entrees and get one free appetizer in the Legends Grill and Elements restaurants. (The Elements restaurant will offer a special appetizer for this benefit). Get a free fountain drink when buying a meal in Village Haus and Summit Haus restaurants. Retail: When you buy a full ski or snowboard rental you may 1. get the helmet for free, or 2. upgrade the rental for free. *You may choose only one. Please visit us on the web at angelfireresort.com. Then contact us at 844-218-4107 to make reservations. Anser Services - S H E A R - We offer free set-up and the 2nd month of call answering services free. Please visit us on the web at anser.com. Mention coupon code lobo10off when submitting an inquiry. Arby's - S H E A R - Receive a 10% discount on regular priced menu items. Value meals and advertised specials are excluded. This offer is available from all participating Arby's Restaurants in New Mexico. Your LoboCard must be presented to receive the discount. Arie's Dogland LLC - S H E A R - Show your LoboCard when you buy ten days of full-day play group at our indoor canine day care, and get two days free! A daily treat and play group insurance are included. The play groups are supervised, and on rubber flooring for comfort. Please visit us on the web at AriesDogland.com to see the range of supplies and services we offer, or come in person to see the new facility too. We are located near the "big I" at 3530 Pan American Freeway NE, suite H, Albuquerque 87107. Contact us at 505-884-4335 or ariesdogtraining@hotmail.com. Armstrong Relocation and Companies, Agent for United Van Lines - S H E A R - We are a comprehensive source for moving and relocation services. Our specialty is being a one-stop point of contact and coordinator for all your relocation needs. You decide the services you want. (By combining services you may save a lot of money.) We offer a LoboPerks discount of 15% off interstate moving, free full-replacement valuation with 0 deductible, and 30% discount off storage in transit. Please visit us on the web at armstrongrelocationviaeandi. While you are on the page, you can insert a few details and submit the information to request a formal moving estimate. In addition, you can learn more about the services we can provide that offer CASH back. When you are finished, contact John or Leta to get your LoboPerks discounts, ask questions, or get details. John's contact info is: 585.749.1643 direct, or jsilvernail@goarmstrong.com. Leta's contact info is: 918.362.8308, or lhardin@goarmstrong.com. You may also call them toll free at 800.677.8305. AT & T Wireless - S E - Faculty & Staff receive 17% off qualified wireless services. Students receive 10% off qualified wireless services. If you have your own tablet, add service and receive a $100 bill credit. If you wish to order on line, please visit us on the web via this link. You can also receive the same discount by visiting any AT&T retail store. The closest store to The University is 2200 Louisiana Blvd. NE., Suite 8c / Albuquerque, NM 87110 / 505-830-2720. Please make sure to bring proof of employment or ID for students. Are you already an AT&T customer? Add your discount on the web - here. If you have other questions contact Paul Alberry at pa8491@att.com or 520.222.3007. Aurafitness - S E - $2 discount on yoga classes offered on the schedule. 10% off Personal Training packages. Discounts available from our location at 1337 Gusdorf Road, Suite S, Taos, NM. Please visit us on the web at aurafitnesstaos.com. Auto & Home Insurance by California Casualty - H E R - Higher Ed group discount, top quality service and exclusive policy features designed for your profession - and your life. California Casualty has over 60 years experience specializing in auto and home insurance for education professionals like you. Exclusive benefits include deductible waiver, $500 personal property coverage, summer skip payment option, and free ID Defense protection. For more information, click here. Call 1-866-680-5142 or visit calcas.com/unm to get started now. AVON - S H E A R - Through an Independent Sales Representative, Lillian Valdez. Receive a 10% discount on all regularly priced items through representative delivery orders. Avon has so much to offer! A new catalog is available every two weeks. For orders over $50, you will receive a free gift. Please visit me on the web at youravon.com/lillianvaldez or email me at lillian@abq.com. Interested in selling Avon? Contact me today!! Backyard Buildings - S H E A R - We offer 10% off all sheds and accessories. The discount cannot be combined with other offers or applied to previous purchases. We have over 30 showroom locations nationwide waiting to serve you. Please visit us on the web at backyardbuildings.com. Enter promo code UNM2013 at the end of your checkout. Bank of Albuquerque - H E - Bank of Albuquerque has LoboPerks discounts reserved for those who qualify and open a new personal checking account, submit and application for a mortgage or auto loan, and meet other requirements (Restrictions apply). There are too many great discounts and details to list, so please contact Rochelle for the scoop on your LoboPerks discounts. Rochelle Higgin: 505-855-0506, rhiggin@bokf.comorBankofalbuquerque.com/rochellehiggin. Bank of America at Work - H E - Receive discounts on banking services when you register an existing checking account with the Bank of America at Work program, or receive additional incentive when you open a new account. For details on the program, please visit us on the web at bankatwork.bankofamerica.com/homeloans. Visit any banking center to register an existing or open a new account. Be sure to notify the banking center that you are employed at UNM and would like to be a part of the Bank of America at Work program. Birthday in a Box - S H E A R - We have what you need for birthday festivities, social get-togethers, showers and parties for any occasion. Birthday in a Box has it covered. Please visit us on the web at birthdayinabox.com. Get 15% off your entire order by using code BB926Z at checkout. Customizing balloons is included in the price! Bistronomy B2B - S H E A R - 20% off all food purchases every Tuesday from 4 - 9 p.m. (excludes alcohol purchases). Offer valid with presentation of LoboCard or hospital badge. We are located at 3118 Central Ave SW. Please visit us on the web at bistronomyb2b.com for more information about our menu. Bloomberg Businessweek - S H E A R - 85% off regular Businessweek Magazine subscription pricing. No special code required. Body and Brain Yoga - S We offer 50% off any regular membership for full-time students. Please visit us on the web at bodynbrain.com/albuquerque. Then check our locations in person. You can find us at 6300 San Mateo Blvd. NE, 1644 Alameda NW, and 800 3rd Street NW. Bodylanguage - S H E A - Offering classes in Barrefusion, BarreLite, Barre FleXX, BarreStretch, & tabata barre, Pilates, Spinning, Yoga, Fitness, & Weight Loss. First class is free! Students may purchase a 10-class card for $100.00 or attend unlimited classes for $65.00/month. Faculty/staff/hospital employees/alums may attend unlimited classes for $85.00/month. UNM ID required. Discounts are available from our location at 3301 Menaul NE, Suite 29 (next to Cost Plus/World Market). Please visit us on the web at bodylanguageabq.com. Brilliance, LLC - S H E A R - Receive a $50 discount off any product we offer. Brilliance is the smarter way to buy diamonds and jewelry online. Use code BC50ED at checkout. Please visit us on the web at brilliance.com. Broadstone Heights Luxury Apartments - H E - All UNM and UNMH Employees will get their deposit waived (normally $100, $150 or $200). Please visit us on the web at LiveatBroadstoneHeights.com to see what you're missing! Contact us at 505-798-0505 or Broadstoneleasing@irliving.com. Burris Computer Forms - S H E A - 10% discount on blank, printable forms (Print-your-own postcards, note cards, greeting cards, door hangers, etc.) on online orders up to $600.00. Use coupon code BURRISLOBO at checkout. Buses For Sale - S H E A R - Please visit us on the web at bargainbusnews.com. Receive 10% off your purchase when you use coupon code lobo10off when submitting an inquiry. California Casualty Auto & Home Insurance - H E A R - Higher Ed group discount, top quality service and exclusive policy features designed for your profession - and your life. California Casualty has over 60 years experience specializing in auto and home insurance for education professionals like you. Exclusive benefits include deductible waiver, $500 personal property coverage, summer skip payment option, and free ID Defense protection. For more information, click here. Call 1-866-477-7423 or visit calcas.com/unm to get started now. Don't log in! Click the “tab” associated with your role (Students, Faculty, Staff). Find the LoboPerks tile and click “Details” to flip it. Create your Tix2FUN account. Be sure to format your phone number like the example when you set-up your account and password. If you have already created your account, just log in. Carports and More - S H E A R - Our products are soft-sided portable covers for outdoor applications. That means canopies, garages, carports, sheds, greenhouse kits, RV covers, garage door screens, shade sails, firewood storage racks, and more types of affordable structures and storage than can be listed here. Delivery is free. We offer 10% - 20% off portable covers in addition to the free shipping. Note: This discount does not apply to steel buildings. Please visit us on the web at carportsandmore.com. Use discount code: UNMEDU15 at checkout. For more information contact us at sales@carportsandmore.com or 877.275.7048. Car Part Kings - S H E A R - Receive 10% off ALL online auto part purchases. Please visit us on the web at carpartkings.com. Enter discount code NMCPK85 at checkout. Carol Wright Gifts - S H E A R - Carol Wright Gifts offers a wide variety of household items, clothing, shoes, and "As Seen on TV" products. Our catalog carries more than 2000 products. Unconditional 10% discount on all purchases. Use the discount code CWPP10 at checkout. Please visit us on the web at carolwrightgifts.com for more information. Cheese & Coffee Cafe Downtown - S H E A R - Get 10% off lunch with purchase of any sandwich and beverage. Good only at Cheese & Coffee Downtown: 119 San Pasquale Ave SW. Please visit us on the web at cheeseandcoffee.com for a menu preview and more. Valid UNM ID required for the discount. Christian Raphael Hypnotherapy - S H E - A New You is Possible! I offer $99 sessions to the UNM community. My sessions are usually $120. Learn Peak Performance in High Stress situations. Become a Forever Non Smoker. Slim down to your ideal Body Shape. Learn how to Achieve your goals. Be a Confident Public Speaker and a Calm Confident Test Taker. Please visit me on the web at christianraphaelhypnotherapy.com. Chrysler - E R - The Chrysler Group AffiliateRewards Program offers UNM employees, retirees and their spouses the Preferred Price* (1% below factory invoice) on the purchase or lease of most new Chrysler, Jeep, Dodge, Ram and FIAT vehicles. You'll find that the Preferred Price - combined with current incentives - can help you save up to thousands of dollars off the MSRP**. Please visit us on the web at chrysleraffiliates.com or call (888)444-4321 to learn more about the program and to obtain your Control Number. You'll need the UNM company code, which is DU0Y6S. Take your Control Number, with proof of eligibility (UNM employee or retiree ID or recent paycheck stub) to any participating U.S. Chrysler, Jeep, Dodge or Ram dealership or FIAT Studio. Ask for a copy of the vehicle invoice, and you'll see the Preferred Price (PP) clearly listed. A $75 administration fee applies. *The Preferred Price is the maximum amount you will be charged by a participating U.S. dealer for an eligible vehicle. See dealer for details. Offer valid for up to 2 Chrysler Group LLC vehicles. Check with your participating U.S. dealer for current eligible models and available incentives. Not all incentives may be available as they vary by region and residency of buyer. **Manufacturer’s Suggested Retail Price. Excludes destination, tax, title and registration fees. CJ Pony Parts - S H E A R - CJ Pony Parts is proud to offer 10% off all online orders! Use promo code EDUCATION at checkout. Please visit us on the web at cjponyparts.com. Cliff's Amusement Park - S H E A R - Cliff's Amusement Park is now offering the UNM community a discount of $7 OFF Single Day Ride Passes all summer long! (The regular gate price is $28.95 = tax.) These tickets are good for any day of the 2016 summer season! Cliff's season is April 16th - October 30th. All Day Ride Passes include: entrance in to the park, unlimited rides for the day, and WaterMania if it's open! WaterMania is open Memorial Day - Labor Day. ***Important: This discount is only available if you buy your tickets online. So please visit us on the web via this link to buy your tickets. The link takes you to Cliff's UNM LoboPerks page with the discounted prices. Cliff's is located at 4800 Osuna NE, Albuquerque, NM 87109. Coastal.com - S A - We offer 30% off eyeglasses, frames and lenses, 20% off sunglasses, and 10% off contact lenses. Students and Alumni, please visit us on the web at coastal.com/student-discount and use the promo code associated with the item you want. Coldwell Banker Legacy - S H E A R - 50% discount on inspections when selling or buying a home. Discount available from our location at 8900 Carmel NE. Please visit us on the web at Edsellmyhouse.com. Cole's Helping Hands Massage - ﻿S H E ﻿- Cole's Helping Hands Massage provides LoboPerks discounts on Massage Therapy, Cranial-Sacral, and Bodywork to UNM students, hospital employees & medical residents, and employees. The discount is $5 off a 1 hour treatment, and $10 off a 1.5 hour treatment. That reduces the price from $45 to $40 for 1 hour, and from $60 to $50 for 1.5 hours. Be sure to bring your LoboCard or UNM Hospital ID to get the discount. For more information about Cole's Helping Hands Massage please visit Cole's on the web at m.facebook.com/Coles-Helping-Hands-1013160578696605. You may also email coleshelpinghands@gmail.com or call 505.321.5669. Cole's Helping Hands is located at 202 Morningside SE, Albuquerque NM 87108 in Nob Hill, which is one block south of Central. Cole Dawson, NTS/LMT is the owner and operator. Company Folders, Inc. - S H E A R - 10% off all printing and graphic design services. Enter discount code LOBO10 in the order form to apply the discount. 20% off all photo folders, enter LOBO20 to receive this special discount. Company Folders is a boutique print shop offering custom-made marketing collateral. We specialize in presentation folders, offering a large variety of multi-pocketed die-cut designs and printing methods for inspirational folder designs. Please visit us on the web at companyfolders.com for more information or to place an order. Cool Springz Trampoline Park - S E - We have thousands of feet of trampoline space in addition to basketball dunk, dodgeball, a 4-lane foam pit and a kid's court for small children. Fitness classes are Monday through Thursday at 5:30 p.m. and Saturday morning at 9:00 a.m. Show your Lobo ID and receive $2 off your one hour jump session Monday through Friday, or $1 off your one hour jump session on Saturday or Sunday. We are located at 4320 Yale Blvd. NE, Albuquerque, 87107. Please visit us on the web at coolspringz.com or email us at info@coolspringz.com for more information. Corporate Shopping Company - S H E A R - See Category: Corporate Shopping Company for UNM's customized portal. CORT Furniture Rental - S - Student Rental Packages -(3) Room Furniture Rental Package on a 12 month lease $99.00 per month , (3) Room Furniture Rental package on a 9 month lease $129.00 per month. Add a bedroom $55 per month to any pkg, Add a study, (Desk, Chair and Lamp), $30 per month to any pkg. No Credit Check, Must have a valid Student ID, 1 Month Refundable Security Deposit Required. 10% off in our clearance center. Please mention you saw us on UNM's LoboPerks website. (Discount can be applied to all segments above "SHERSAR"). Discount available at our 5901 Pan American Fwy NE location. Please visit us on the web at cort.com/student. Costco - S H E A R - Receive a $10/$20 cash card when you sign up for a new membership at either the Eubank or Renaissance store in Albuquerque. The offer is not available online. So, please visit us on the web at costco.com. Then come in and become a Costco member. Bring a print of the LoboPerks page with the Costco listing for smoother processing. Costume Discounters - S H E A R - At checkout, all University of New Mexico Lobos may enter a unique discount code"LPUNM" to receive 16% off any item in our store! Please visit us on the web at CostumeDiscounters.com for all your costume needs. Costume SuperCenter - S H E A R - 15% off our huge selection of costumes for all ages. We also have costumes for school performances, theatrical costumes and mascot costumes for schools and businesses. Use promo code DSCC159124 at checkout to receive the discount. Visit us on the web at costumesupercenter.com for a complete listing of costumes. Country Brook Design - S H E A R - Discount: 5% off entire website, including dog collars, leashes, webbing, and webbing hardware. To Redeem: Upon checkout, use discount code: GOLOBOS. Please visit us on the web at countrybrookdesign.com. Cozy Wall Art - S H E A R - CozyWallArt.com is a premier source for unique and beautiful wall art for your home. We offer the UNM family a 10% discount on all purchases. Please visit us on the web at cozywallart.com. Then just enter the coupon code "UNM10" during checkout. CPAP.com - S H E A R - We offer a 10% discount on CPAP supplies. It cannot be combined with any discount, sale or coupon. Please visit us on the web at CPAP.com and see our huge inventory. Use discount code: lobodiscount. CPRCertified.com - S - We offer 50% off any of our courses to students when they use the code "STUDENT50" at checkout. The maximum discount is $50 if more than one course is purchased. When receiving CPR certification, online training is the most convenient way to go. We offer an in-depth curriculum developed by AHA-licensed CPR instructors. Our CPR online certification is compliant with ARC, ECC, ILCOR, and LCC-LCOR guidelines. Our certification is valid for two years, and it is accepted nationwide and overseas in more thatn 60 countries. Companies all over the world use our online programs to train their employees. Please visit us on the web at CPRCertified.com for more information. CustomButtonCo.com - S H E - Get 10% off on your next order of custom campaign style buttons. Use the promo code UNM10 when checking out. Please visit us on the web at custombuttonco.com. deerBrooke the LAWNSPRINKLER EXPERTS - S H E A R - We offer 5% off all service call fees and cost of materials. (Labor over and above the service call is not discounted.) This offer is good in Bernalillo and Valencia counties. Please visit us on the web at nmlawnsprinklerexperts.com to see the extensive list of services we can provide, including emergency services. Contact us at 505-319-5730 or deerBrooke@msn.com. Defined Fitness - S H E - Voted BEST Health Club, Defined Fitness offers a discounted rate of only $38.99+tax per month with enrollment in our automatic payment program. Membership includes access to all club locations, group fitness classes, aquatics complex (indoor pool, steam room, sauna and hot tub), state-of-the-art equipment and free supervised child care. Personal training and youth programs are also available. $75+tax initial fee applies to new members / $25 re-activation fee applies to members that have been inactive for two or more years. Visit us on the web at defined.com. Dell Computers - S H E A - Discounts range from 2%-30% depending upon the product. Eligible individuals receive our Best Price Guarantee which insures discounts on all consumer Dell computers as well as discounts on thousands of electronics and accessories. Finally, Dell University customers get access to our highest level of technical support. Discounts are available anywhere in North America by visiting us on the web at dell.com/unm. Denny's Restaurant - S H E A R - 15% discount on all food and beverage purchases. Proper UNM ID required. Discount available from our locations at 2608 Central Av SE, 11261 Menaul Blvd NE, and 1602 Coors Rd NW, here in Albuquerque. Please stop by the Central Av location and check out our newly renovated dining room and private meeting room. Meeting room available upon advance reservation. For more information contact marilyn_costanza@yahoo.com. Dish Network by Connect Your Home - H E A R - Get a $100 Prepaid Visa Card as a UNM employee when you order DISH Network through Connect Your Home. As a new customer also get: Free installation, Free HBO & Showtime for 3 months, Free Hopper, and Savings up to $750 the first year. Please visit us on the web at connectyourhome.com. Call 866-982-6613 for complete details. Use Promo Code: 1068001. DIY Tax Center LLC - S H E A R - DIY (Do It Yourself) Tax Center provides assistance to help you prepare your tax return. Or if you prefer, we will provide full-service tax preparation. For the "Do It Yourself" we provide computers, software and technical advice. You could save hundreds of dollars by inputing your information. We simply charge for our time. Use less time and pay a smaller fee. Last year the average fee was well below $90. New clients will receive a discount of 21% of the time used. To qualify, bring your LoboCard or other proof of affiliation with UNM. Our address is 2625 Pennsylvania St NE - Suite 625, Albuquerque, NM 87110. Our office is just north of Menaul on the west side of Pennsylvania. It is on the bottom floor toward the north end of the building. Please visit us on the web at dwebberllc.com or contact us at 505-243-7800. Door Emporium - S H E A R - 15% discount off orders under $2,000, and 20% off orders over. Door Emporium has been a manufacturer of exterior, interior and custom entry wood doors since 1954. Use discount code EDUDESALE15 when ordering at dooremporium.com. Dr. Leonard's Healthcare Corp - S H E A R - Dr. Leonard's Healthcare Corp. offers a wide variety of medical supplies, healthcare products and household items. Our catalog carries more than 2000 products. Unconditional 10% discount on all purchases. Use the discount code DLPP10 at checkout. Please visit us on the web at drleonards.com for more information. Dream Factory Productions - S H E A R - Receive a 10% discount on any DJ entertainment package. Please visit us on the web at Dreamfactorydjs.com or email us at Dreamfactory009@aol.com for more information. DISCLAIMER: By listing businesses and their offers in these pages, neither the University of New Mexico nor the LoboCard Office is endorsing these businesses or the goods/services they offer. We have been in contact with the businesses, or they have contacted us, regarding partnering in our discount program. The listings are provided by the respective businesses, and the University is not responsible for whether the information in them is accurate or current. Be a wise consumer and research services and discounts appropriately.